I am fascinated by the persistence with which Ambedkar gets back to the question of ‘the past.’ A superficial take would suggest that his are not serious interrogations of history - for which Ambedkar did not have the time or the temperament. Rather, these are fragments that pursue the faux historical tone of the question: how was something like untouchability possible? The power of the phrase comes from the combination of two questions into one; the first is a presentist question: how is it possible for people to act like this towards members of their own society? The second is a genuinely past-related curiosity: how did something so inhuman come into existence: how, where, for what reasons? I will suggest in my talk that this is a fairly common form of writing about the past which is not given a distinct name because of the overly general use of the term ‘history’ for all kinds writings dealing with the past. I will argue that there is a form of writing used by thinkers who have an insistent past-related question to resolve for which cognitive resources of conventional-positivist history are not sufficient. I suggest that we classify this kind of writing as a class, give it a conceptual name, and treat Ambedkar’s engagement with history as key example of it. 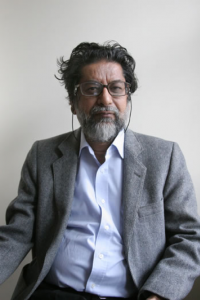 Sudipta Kaviraj is professor of Indian politics and intellectual history at Columbia University. He has taught at the School of Oriental and African Studies, University of London, and Jawaharlal Nehru University, New Delhi, and was an Agatha Harrison Fellow at St. Antony's College, Oxford. His publications include: The Imaginary Institution of India (2010) Civil Society: History and Possibilities co-edited with Sunil Khilnani (2001), Politics in India (edited) (1999), and The Unhappy Consciousness: Bankimchandra Chattopadhyay and the Formation of Nationalist Discourse in India (1995). This lecture recognizes Kavita Saraswati Datla’s contributions to the field of South Asian history. Professor Datla passed away in 2017, after a three-year battle with cancer. A generous gift by her family has endowed this annual lecture, to honor her memory at the institution where she first developed her love for South Asian history, and to which they have strong ties. Kavita S. Datla graduated from the University of Michigan with a BA in History in 1997. She received an MA in South Asian history from the Centre for Historical Studies at the Jawaharlal Nehru University, New Delhi (1999), and a PhD in South Asian History from the University of California, Berkeley (2006). Upon completion of her PhD, she joined Mount Holyoke College as an Assistant Professor of History, and was promoted to Associate Professor in 2013, and Professor in 2017 (posthumously). She is the author of "The Language of Secular Islam: Urdu Nationalism and Colonial India" (University of Hawaii, 2013), a critically acclaimed history of Urdu and nationalist politics in early-twentieth century India, as well as articles in leading journals, such as "Modern Asian Studies" and "Law and History Review."